Click the deployment button and the Azure portal opens. Choose to create a new resource group and give it a name. Only other required parameter is a name for the service. Notice that the deployment will pull the source code directly from the open-source repository on GitHub. If you have forked the repository, you can point to your own for and a specific branch. After filling in the details, you can start the deployment. Once the deployment is complete, you can point your browser to https://SERVICENAME.azurewebsites.net/metadata to obtain a capability statement. It will take a minute or so for the server to respond the first time. When no longer needed, you can delete the resource group and all related resources. To do so, select the resource group containing the provisioned resources, select Delete resource group, then confirm the name of the resource group to delete. 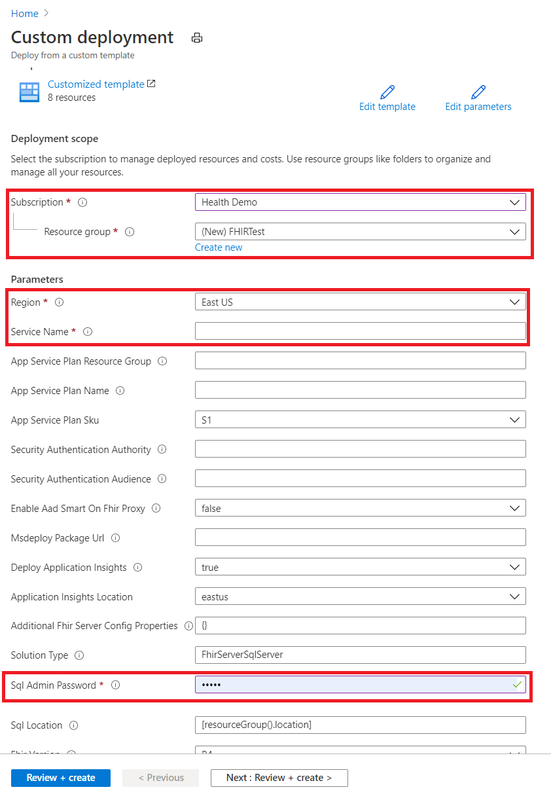 In this tutorial, you've deployed the Microsoft Open Source FHIR Server for Azure into your subscription. To learn how to access the FHIR API using Postman, proceed to the Postman tutorial.